A very quick trip to Phoenix but long enough to try some creative Mexican food at the Barrio Cafe north of the Hyatt (where D. has a meeting this week.) The place was fun, lots of interesting people including a woman sitting at the bar who has written a book about fixing up a house in the “west village” neighborhood of Detroit. She and her husband moved to my hometown from Brooklyn, so I guess this Detroit renaissance is really happening. The book is called Detroit Hussle. We also met a cute young couple from Australia (Perth, as it happens, which I have a soft spot for because I had two friends from Perth at my kibbutz years ago who I ended up traveling with in Greece.) Interesting to hear the places they are visiting during a month-long trip to “see America.” They were in Phoenix because they went to the Grand Canyon. Next stop Vegas. All other stops were on the coasts. The food at rhe barrio cafe was interesting. We liked the guacamole (made with pomegranate seeds) and the long cooked pork, the margaritas and horchata (a light milky drink that came in a pop bottle). The chicken mole and corn appetizer were too rich for me. Slow service, as forewarned but a good live band playing what sounded like merenge not Mexican music. finally got a chance to see a little more of Phoenix after many years of whizzing past the city to Tucson (and occasionally Scottsdale). we were in the area around the Heard Museum, driving down straight flat residential roads lined with way tall Palm trees, past lovely old stucco bungalows and Spanish mini villas. we had an excellent lunch at the funky Coronado Cafe, which oozed low key charm and served a fabulous crabcake(the owner proudly revealed her Baltimore roots). also excellent key lime pie and fres lemonade. we did a quick drive through the Roosevelt arts district which had some promising looking galleries and boutiques and along 7th street and the Coronado historic district. 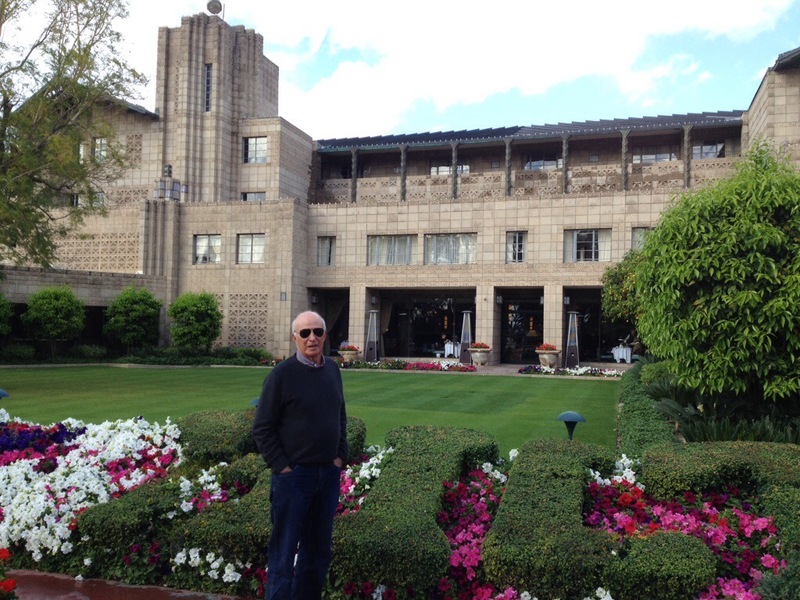 Also visited the famous Biltmore hotel, with frank Lloyd wright-like architecture, lovely gardens and a way cool pool. Pointe hilton tapatico cliffs resort Phoenix and Arizona shuttle. It didn’t occur to me that a shuttle, as opposed to a flight, could be delayed by there I am outside the Phoenix airport waiting for the delayed shuttle to Tucson. Hope it’s not more than 45 minutes behind schedule although heck, just sitting outside the airport terminal in sunny 70 degrees or so weather is a tonic for this Midwestern snowbird. I am leaving Phoenix after two days of work meetings. We were lodged at the very nice pointe hilton tapatico resort in north central Phoenix. Nice place with more pools and hot tubs than I could count, easy access to good hiking trails, a lovely mountaintop restaurant with good food and a spectacular view, especially at sunset. The layout is very confusing with lots of stucco two story spa is buildings rambling up a hilly compound. Didn’t see much beyond our meeting room and the bus taking us to and fro. Did have a good dinner last night at del frisco’s grill near the Biltmore. Yes, we also had some time to kill in the Phoenix Airport on our way back to Des Moines earlier this week and there were plenty of art exhibits to pass the time. One of the odder ones was tucked away in an out-of-the-way corner near the Starbucks on Level 2 of Terminal 3 – 2″ x 2″ Thumbnail portraits, quite literally, by Roberta Hancock. They are individual oil paintings of thumbs dressed in various garbs – a Rastafarian thumb, a nun thumb, a cowboy thumb, a bride thumb. They made me laugh. The Phoenix Airport Museum’s collection has 600 works and 35 exhibit spaces scattered across six buildings. How amazing. One of these days I’m going to stay in Phoenix when we land at the airport there and explore the city (rather than jumping immediately in a rental car and heading to Tucson, where we visit my dad). We’ve poked around Scottsdale a bit but Phoenix has always seemed more interesting yet challenging to explore. And when we do stay in Phoenix, I must remember to take a copy of the NYTimes story “Reviving Phoenix through Art” in today’s paper that talks about a once rundown downtown area that is now an arts district. In addition to several galleries, there is the Downtown Phoenix Public Market which sounds great – with vendors selling everything from produce to herbal remedies. The Asian tapas (“asian tapas?”) restaurant Sens also sounds worth a visit.